Ok, I'm the first to admit that I'm not all that adventurous when it comes to scrapbooking. I usually stick with what works for me - the tried & true. Know what I'm talking about? I'm not really a "technique-y" kind of person either. But I have been venturing out more over the last year and it is rather fun! In fact, I've been changing the color of things and make various elements shimmer & shine - and it's addicting. I've got the Glimmer Mist bug!! That's right! If you're looking for a creative way to change the color or add some shimmer then you've got to try Glimmer Mist by Tattered Angels. These magical little bottles come in all sorts of incredible colors. Gorgeous colors. Bright colors. Soft & warm colors. Vintage colors. Ok, I guess you're getting the point here. I've been teaching a card class and we're using these Glimmer Mists to change white flowers to match our cards. The students have been loving the finished product. 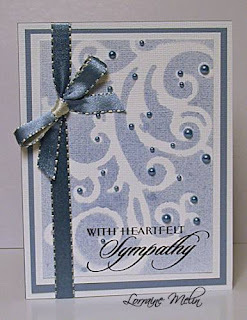 You can also use these mists over a stencil or screens on your cards or layouts just as Lorraine did here on her card. Gorgeous card, Lorraine! The Glimmer Mists are fabulous on chipboard and canvases as well. It will take a bit of drying time but if you're impatient you can always use hairdryer or heat gun to help the processs along. The Tattered Angels website has some great demos on it too so take a look for more inspiration and I'm quite sure that you'll become an addict too! Oh and before I go ... here's a link to Scrap Shotz store for some great colors if you're interested in purchasing some. It's card day today! There is nothing better than receiving a beautiful handmade card... and especially when they are as gorgeous as these ones! Here are two stunning cards that hit our gallery this week! This one is from Nicole.... totally classy! Then there's this fun and frilly and pink one from Stevie... love those cupcakes! You can check out these cards (and many many more) in our gallery... you won't be disappointed you came! A couple weeks ago, Mr. Groundhog or Billy Balzac in Alberta said there would be 6 more weeks of winter! I said, "What? 6 mooooore weeks?" At this time of year, I am start feeling that winter should be over; don't you? Yes, I realize that we have 4 distinct seasons but in Alberta, it often feels like 2 weeks of summer, 3 weeks of spring, 3 weeks of fall and...10 months of winter! We can put money on the fact that it will snow around Mother's Day (and that's in May!!!) So hearing that there will be 6 more weeks of winter puts me in a bit of funk...and I sometimes also get into a creative funk. Do you? To break out of my creative funk, I travel in blog-o-sphere for some inspiration and wait for the creative bolt to hit me! The best places to bring on the creativity are challenge and sketch sites - there is something for everyone, whether you are a card maker or a scrapbooker. Challenge and sketch sites are awesome because they often encourage you to try something that you might normally think of - and being a rebel is thrilling with often fantastic results! Cardalicious - Their cards are DELISH! 2 Sketches 4 You - Their cards are pure eye candy! Basic Grey Challenges - What else can you say about BG??? Cupcake Challenges - Even if you don't alter, you'll be tempted after looking at these! Method Playground - Love the fun techniques and challenges here! I hope these give you some inspiration and get you creating! If you have other sites to share, please leave me a comment here or in the forum! Sorry I'm late this week everyone! I wasn't able to get into the gallery till today and I'm sure you'll agree this one was worth the wait! The photography is amazing... and Kelly was able to do one of the new DT Challenges for February at the same time! Valentine's Day is only days away and I've been trying to think of creative ways to give my valentines. After racking my brains and coming up with nothing, I decided to do a search on the oh so popular YouTube and here's what I found. Here's my version of the bag. I think its great that I only needed a plain old lunch bag, a transparency, some pattern paper, stamps and ribbon. I do happen to have a Slice machine like in the video, but really you could make the peek-a-boo window with a stencil and an exact-o knife. An extra bonus was that it really didn't take long to do and you can fill the bag with anything you want. If you decide to make one, I'd love to see your version in the SSZ Gallery because I have a feeling I may be making a lot more of these in the future for other special days!! Love is in the air! This week I'd like to share some seasonal samples from our gallery! And I just LOVE this gorgeous one by Shannon... that color combo is just so classy! Make sure you pop in and see what everyone else has been working on! The card challenge this week is all about love and I'm sure the girls will not disappoint! Our "Retail Therapy" Online Crop was a huge success. We had so much participation and it was such fun!! The challenges were great and the creations made are gorgeous! You can still check out all the fun challenges in the Online Crop Forum. And please take a minute to cruise through the gallery and check out all the amazing creations. As always the Grand Prizes were phenominal!! The Grand Prize - the brand new Basic Grey Porcelain Collection pack, along with TWO Chatterbox Artsylicious Paper Pads and not only the Scenic Route Garland Line but ALSO the Prima Cavalier Line!! The Card Grand Prize - 2 6x6 paper pads of the brand new Basic Grey lines Marrakech and Porcelain, straight from CHA!! Congratulations ladies!! Enjoy your prizes and thanks so much for participating!! A very important part of every Scrap Shotz online crop is the "Scrap Shotz Gives Back" challenge. Scrap Shotz selects a charity and donates $5 for every layout or card or project completed for that challenge. As this month is Heart and Stoke month the charity was the Canadian Heart and Stroke Foundation. Scrap Shotz raised a whopping $235!! Congrats to Scrap Shotz and a big THANK YOU to everyone who participated in this worthwhile challenge. We're gonna do a "mini" reveal right here today and have the complete reveal for the fabulous February kit in the gallery on Feb 3rd. Make sure you check back in the gallery to see the Design Team Reveal in all it's glory. So, without further ado, here's the Design Team Reveal of the gorgeous February kit "Charmingly Classic"